I told you i had Silver Needle White Tea in my last post, so thought i'd do a little update for those of you wanting to know more about this type of tea. I'm no expert, but i've often found myself choosing this type of tea when i want something light and smooth, such as on a summer day and also when i can't manage anything heavy. Referring to 'The Book of Tea' as seen in my Amazon recommendations to the right, you can see that White Tea is a China tea and different to green, black and semi-oxidised teas because it undergoes 'almost no transformation - once harvested, it is merely withered and dried'. Specifically, the green and black teas are rolled and broken down to start off the oxidation process, which browns leaves and gives them their aromas. To picture oxidation, what happens to an apple when you cut it in half and leave it out? It goes brown. In contrast, white teas are left intact to prevent this happening and only go through the withering and drying steps. Therefore, white tea is possibly more in keeping with its original leaf form and contains the least caffeine compared to others teas. It is also said to contain a higher amount of antioxidants, which are very good for you as they mop-up the free-radicals in your system, which otherwise cause ill health. 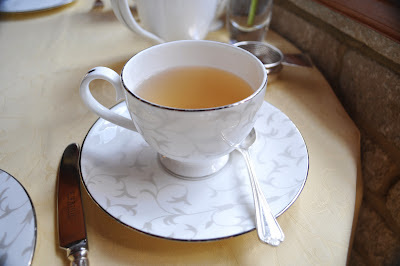 There are several types of white tea and the 'Silver Needle' type is the one i tried at the Pennyhill Park Hotel and Spa. Quoted in 'The Book of Tea', Silver Needles or 'Yin Zhen', are produced "by the imperial plucking method, performed at dawn on only two days of the year". You can see then, why it's thought of as glamorous (and expensive)! The reason it's called 'Silver Needle' is literally because the dried buds have a silver appearance because you can still see the tiny white hairs of new growth on the leaves. Once it goes through your teapot and into your teacup though, you've got a lovely, delicate and refreshing tea of a light yellow colour. For those of you who enjoy the Silver Needle White tea, where do you get yours? I thought that I would make you aware of a promotion we're running at www.innteas.com which may be of interest to you and your readers. This month enjoy a FREE tea strainer with every purchase. Simply add your leaves, settle the strainer inside a cup of water, and remove them easily once your tea has reached the perfect strength. If you'd like some further information, please feel free to email me directly at helen at innteas dot com.